Urban Archeologist: Book Review: Strategy for Survival...Glowing! Radiant! A Story brighter than a thousand suns! Book Review: Strategy for Survival...Glowing! Radiant! A Story brighter than a thousand suns! I am not a pack rat, I can find value in almost anything, but I am fairly selective. When I buy something it has to have more than just a single value, it has to be deeper. I also don't want to raise the ire of my wife, who's job it is to keep my head out of the clouds and my feet on the ground. When I saw these at a Bridgewater, CT tag sale I knew I had to have them. The symbol on the book is not one warning of radiation, but of civil defense. I am sure I saw this book and the color alone caused me to read the label. It's a color best described as "Cold-War Yellow" true caution. Written in 1963 it is a compendium of facts and information about what could be in store for 303 target cities in the US should a thermonuclear war occur and how a strong civil defense plan is the only solution.Worried about whether you should emerge from the fallout shelter you've built to spec in the backyard? The condition of the kit is unfortunate. It had been sitting in a dampened basement for years, but no so dampened that the contents were rusting or smelly. Just the box is stained and has lost its shape and can't be restored to display quality. But I knew when I saw it that I had to have it. I love the cover and its manufacturer's decision to lead with the word "Family" for the title. 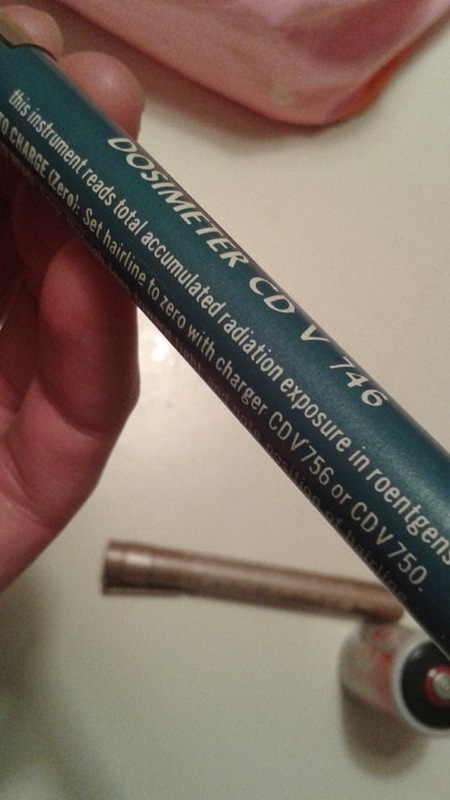 Maybe there was a version for pets, or neighbors, or maybe this was counter to the competitor's product which might have been "Personal Radiation Measurement Kit". I guess "family" indicates that during the threat of nuclear attack you won't take the panic level to the "Every Man For Himself!!" stage and you fully plan to let the whole clan into the bunker. The basic operation of this kit allows you to carry 2 meters that will tell you : 1) if radiation is present, and 2) what level of radiation you have received. 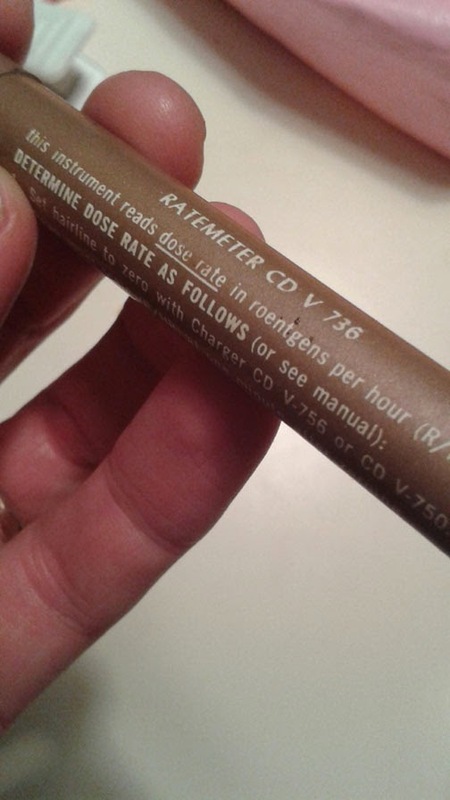 The charger allows the testers to be reset. 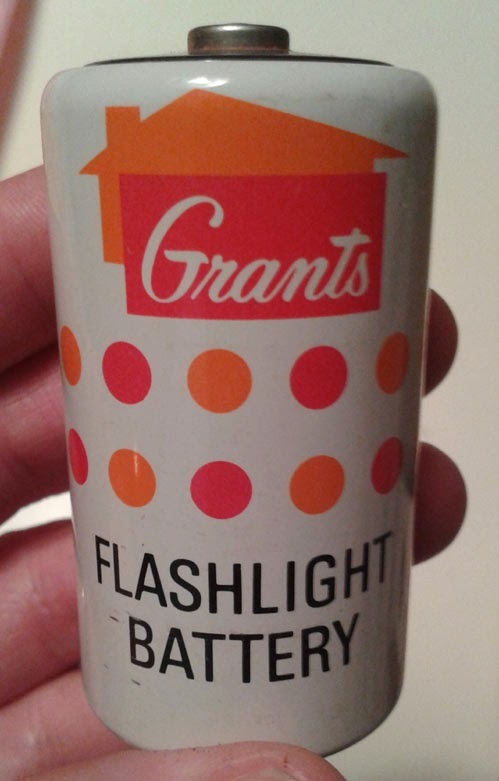 It all works (as best as I can tell) and the addition of the Grant's Department store battery is a nice period touch. I picked this up because I can never pass up scientific equipment and I like to ponder the anachronism that these items represent. Would this sell today at Target? What were these folks thinking? What was it like to have to buy something like this from Woolworth's right next to the picnic baskets and barbecue grills? We seem to have a history of fear mongering. Today, it's economic collapse, yesterday it was nuclear annihilation - I should have invested in fear years ago, it's a stock that keeps paying high dividends.